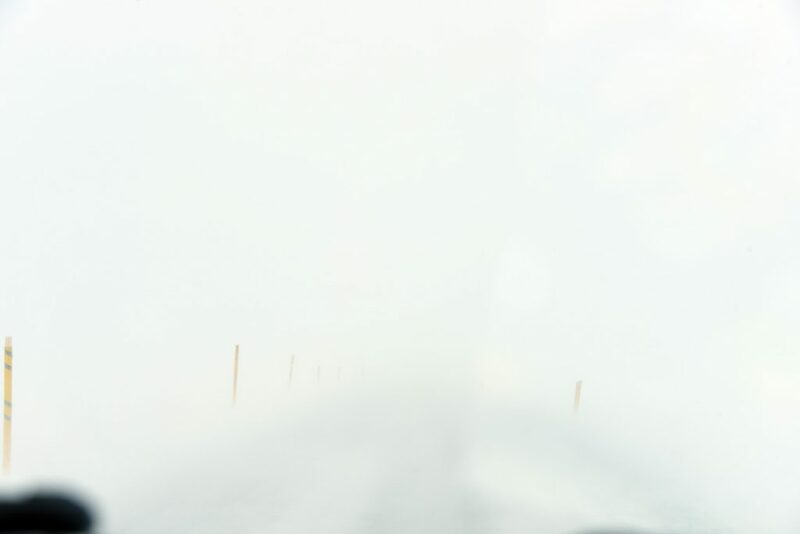 There are a lot of warnings about driving in Iceland — winter driving, high winds, narrow roads, sandstorms, and gravel. If you’re not used to driving in the snow, for example, attempting an Icelandic winter drive is not something you want to use as training. Roads switch from paved to gravel with alarming regularity and sometimes with little warning, and most of the bridges outside of Reykjavik are single-lane. It’s not a place for casual inattention. Pay attention to the warnings–they really are accurate. Perhaps the first thing you’ll hear when renting a car is about “F-roads”. These are roads in the highlands that are open only a few months or weeks in summer, and suitable only for 4×4 vehicles. And by 4×4 they don’t always mean your all-wheel-drive Subaru, either. High clearance and big tires are required since you may be driving some pretty hairy unimproved stretches. Don’t even attempt these unless you have four wheel drive. Trying them in your standard rental sedan will void your insurance and — more likely — get you stranded somewhere even in the best of weather. There is another class of highland roads as well, marked ‘Torleiði’ — ‘difficult road’. I think it’s an understatement, given some of the vehicles we’ve seen that are equipped to drive on them. These roads are intended for serious 4WD vehicles with high ground clearance and the necessary equipment to ford rivers and climb rocks. One of the books I have, “Off the Beaten Track in Iceland” details several routes that require a snorkel, a convoy, and winches. Nearly all the tours offered have some sort of super-jeep vehicle that is designed for snow and glaciers. 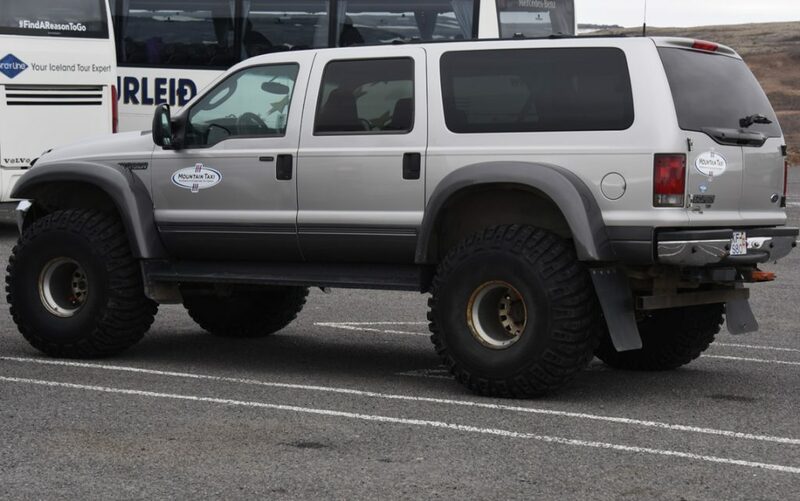 They are serious 4×4 vehicles. Mr. Phouka really wants one. Most F-roads open sometime in early June, giving access to the interior of the country for only a few weeks each year. They are usually clearly marked with warnings for Jeeps or 4x4s only, and the roads themselves are usually chained off/blocked until summer. We were too early in the season to go anywhere near the mountain roads — but the lure of big waterfalls and gorgeous river canyons has us planning a return trip in summer when they will be accessible. 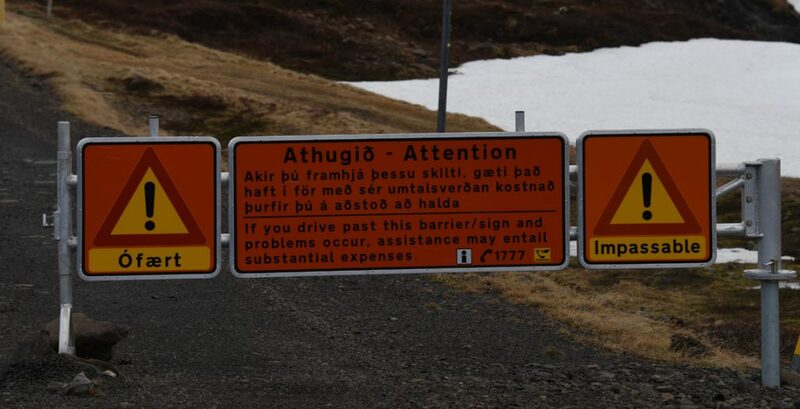 The status of mountain roads (f-roads) is tracked carefully, and reported by the Icelandic Road administration (Current Condition of Mountain Tracks.pdf). The average opening times are noted in the tourist brochure for “Mountain Roads“. In General, roads in Iceland are well-maintained and the major routes are (mostly) paved. However, that doesn’t translate to the sort of freeway you may be used to. While paved, many roads are built up on high berms and there is little or no shoulder. A few inches off the asphalt, and the siding is soft and you’ll be careening down into the ditch. And, in any case, you should not pull off a road except in a well-defined siding or parking area, to avoid damaging delicate plants and fragile ground cover. One driver going across a mossy space, ripping up plants and gravel, can cause damage that takes years to repair. However, since there really is no traffic outside of the major cities, you can pretty much drive straight down the middle of the road, deviating to the side only if there is an oncoming car. Since a lot of roads don’t have actual lines painted on them (at least not any more), it’s hard to track anyway. Just remember — they drive on the right in Iceland, so veer right! Paved roads vary from lovely new blacktop roads with bright lines and smooth surfaces on parts of the Ring Road (rt 1) to rough asphalt. Then, often abruptly, the road will change to gravel. Pay attention for a sign that says “Malbik Endar” for notice that the road is going to transition from paved to graded gravel. Most accidents occur when people drive through the transition at high speed and start to slide — slow down when you see the sign and prepare for things to get a bit rough. Gravel roads also vary: from well-graded and oiled roads that are nearly as smooth as the paved ones, to hugely rutted, washboard stretches that threaten to rattle your teeth out. There are stretches of main road that change to gravel and back again, it’s not just small side-roads that are gravel. 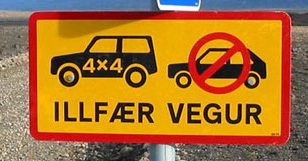 Many coastal roads in the westfjords are not paved continuously. Our hotel host the first night commented that we had “the right vehicle” for driving on the gravel — big, wide, soft tires that would “float over the gravel”. Well, they did make the ride a big smoother, but they also tended to shimmy when the road was washboard. I can only imagine the bumpy ride if we were driving a tiny rental car — rather like riding inside maracas, I think. Weather is a huge issue in spring, especially — snow, wind, heavy rains, and flooding often render even normal roads impassible. The status of roads is constantly updated, and you can (and should!) check www.road.is for current conditions. They can change pretty abruptly. It is important to check often, by the way. A lovely drive in the morning with blue skies and rainbows can turn into a full-fledged blizzard just as you start to drive up over the mountain pass. Ask me how I know. The picture above was on a relatively major road, Rt 63, in the Western Fjords. The morning was stunning and blue-skied and perfect and by early afternoon…this. The road was fine until we rose up over the pass and then it was a full-fledged blizzard with 45-mph winds and snow. We could see the posts for the road. We turned around — after driving carefully at 5mph for a few minutes looking for someplace to do it safely. We had no idea if the roads had shoulders, if there was a giant cliff, or what. We finally found a pull-off for the snow-plow and were able to get turned around and back down into the valley. I had checked the roads that morning and all was good — green. The storm rolled in and the road was basically impassible to traffic. Oh, Mr. Phouka was sure we’d be fine, but even he agreed we had to turn around when the visibility got even worse than the picture. It wasn’t even an f-road, just a normal secondary road over the mountains. Just a few miles earlier we had been in a lovely lush valley, admiring the farms.